For over thirty years, Keola Beamer artistry has helped breathe new life into slack key guitar music while remaining true to the soul of its deeply Hawaiian roots. Born February 18, 1951, in Honolulu, Keola grew up in one of Hawai'i's most famous music families. The Beamers can trace their involvement in Hawaiian music and hula at least as far as the 14th Century. 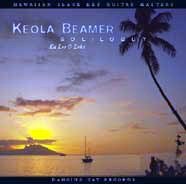 Keola's sixth Dancing Cat album, Ka Hikina O Ka Hau (The Coming Of The Snow), is not a traditional slack key recording. "It poses a simple question," he says. "Can the palette, coloration and tonality of Ki ho'alu add an indefinable something to the interpretation of songs written by truly great composers?" The answer is a wonderful surprise. The album features eighteen arrangements of classical compositions by Satie, Ravel, Stravinsky, Mendelssohn, Rimsky-Korsakov, Dowland, Piazzolla and others, as well as two more Hawaiian inspired pieces. For the first time Hawaiian Slack Key guitar tunings have been used to interpret the works of classical composers, resulting in a romantic, winter oriented album that uniquely blends both the Hawaiian Slack Key and classical music traditions. 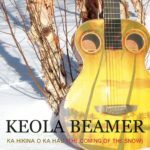 Arranged for two or three guitars, specifically for Keola by musicologist, guitarist, and linguist Daniel O'Donoghue, Ka Hikina O Ka Hau (The Coming Of The Snow) highlights Keola on acoustic nylon string, acoustic steel-string, and electric guitars, overdubbing multiple tracks to create a truly unique sound. Read John Berger and Wayne Harada's reviews of "Ka Hikina O Ka Hau"
Produced by Keola Beamer, Daniel O'Donoghue, and George Winston. Engineered by Howard Johnston. Additional engineering by Loredana Crisan, Justin Lieberman, Rachel Allgood, Porter Miller,Dave Russell, Jared Warner, Ron Rigler, Adam Muñoz, Tyler Crowder, and Matt Silveira. Mastered by Bernie Grundman at Bernie Grundman Mastering, Hollywood, CA. Cover photo by Donley Smith. Art direction/Design by Frank Harkins. Editorial assistance by Chris Orrall. Keola would like to thank Moana Beamer, Nona Beamer, Kaliko Beamer-Trapp, and Meg Lawson. Daniel would like to thank Laura Vecchi for the use of her computer. Special thanks to everyone at Dancing Cat Productions & SONY BMG, Ron Rigler, and the girl in the window.